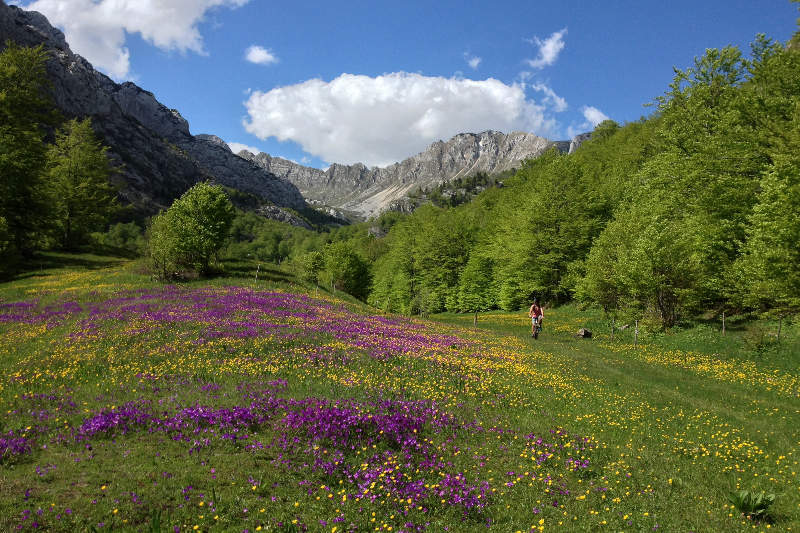 You should never turn down an opportunity to visit Durmitor National Park in northern Montenegro. As a UNESCO World Heritage site, the mountain range will cause anyone with a camera to max out their SD card. You cannot find a view that doesn’t take your breath away and in a quiet moment elicit reflections on life, the universe and everything. However, it also invites you to enjoy not-so-quiet moments. 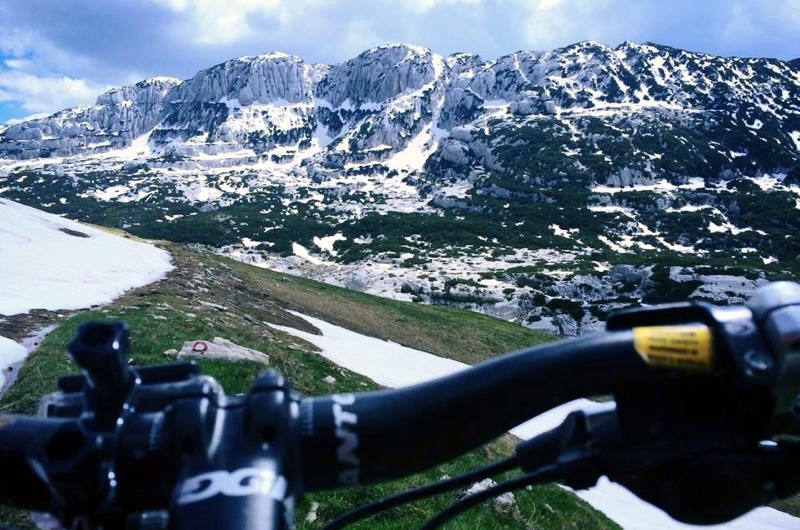 We ventured out to go mountain biking Durmitor on a recent day under the amiable expertise of the guides from Montenegro+. Our group was atypical for mountain biking – with only one of us having any experience. Our lack of knowledge didn’t slow us, and after some hands-on instruction with gears, braking and strapping on GoPros, we were on the road, literally. We biked up a steady incline for about two miles, marveling at the amount of snow still on the ground in late May. When we left the road, we couldn’t decide whether to pedal or click. On the one hand, we were eager to discover what lay around each bend in the trail which climbed and descended through four diverse environmental zones – snow, rocks, pasture and woods. 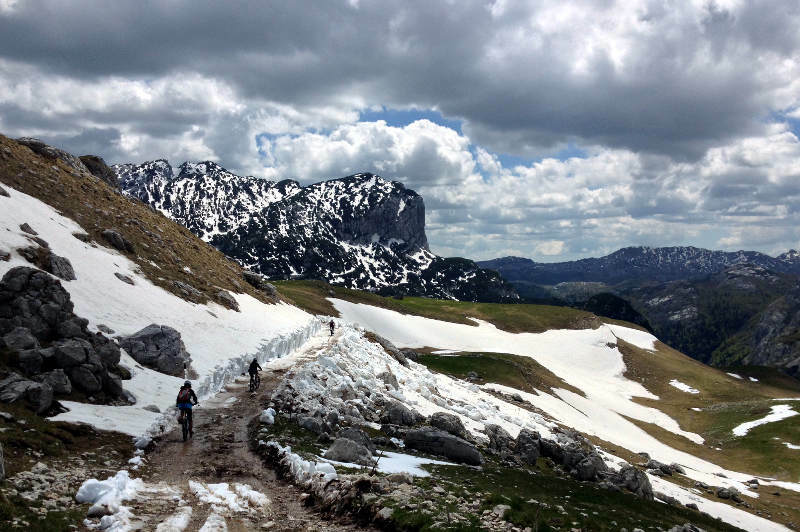 There were places in the trail in late May where we biked between plow-cleared snow drifts of two meters high, working hard to navigate the muddy-snowy slush still on the trail. The clicking was from our cameras as we stopped often (perhaps as an excuse to catch our breath!) to take pictures of the rude beauty – a kind of “in your face” panorama. There’s no place that you can visually escape the ocular wonder. As most of us were novice bikers, we did have to choose – you’ve got to keep your eye on the trail due to the rocky descents of some portions of the trail. With all of our picture clicking, we managed to squeeze 29.2 km of road and trails into six glorious hours. After navigating the snow and mud, we thoroughly enjoyed the last half of the trail which led us through grassy descents and forest-enshrouded turns. By the time we reached asphalt, we biked through the tranquility of the small community of Grabović and found the 19th century chapel on a nearby hill enchanting enough for one last click. 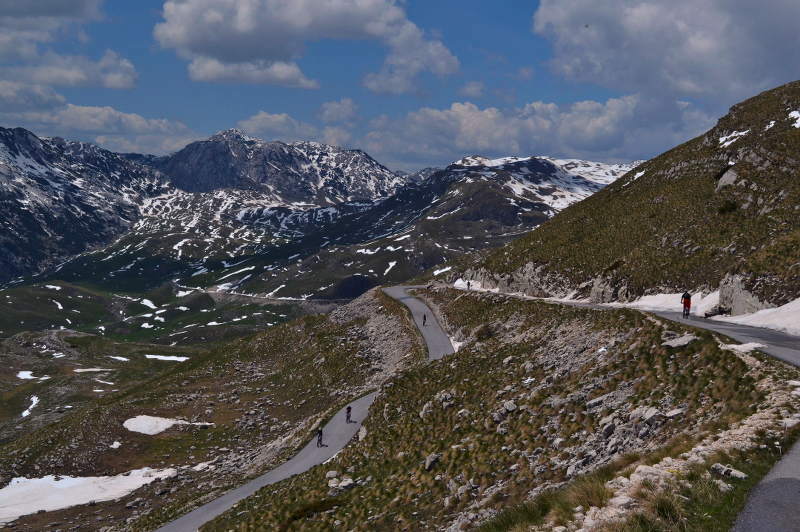 Riding into the Durmitor massif, we are about to hit the trail. We biked through snow, mud, rocks, and fields of green. This was one of the spots where the snow and mud intersected. Everywhere you turn, the view is majestic. 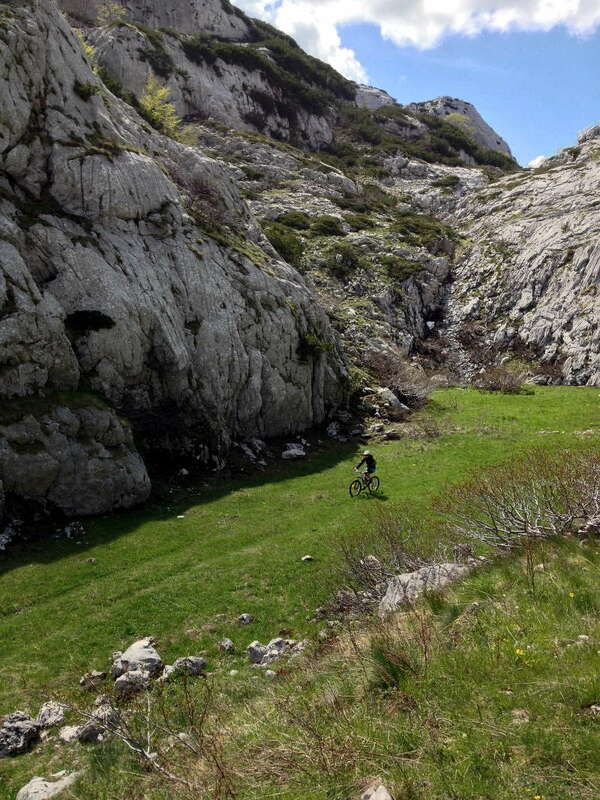 Coming off the massif, we biked through the fields with the backdrop of rock all around. At some points, it is possible that we backed up and went through it a couple times. 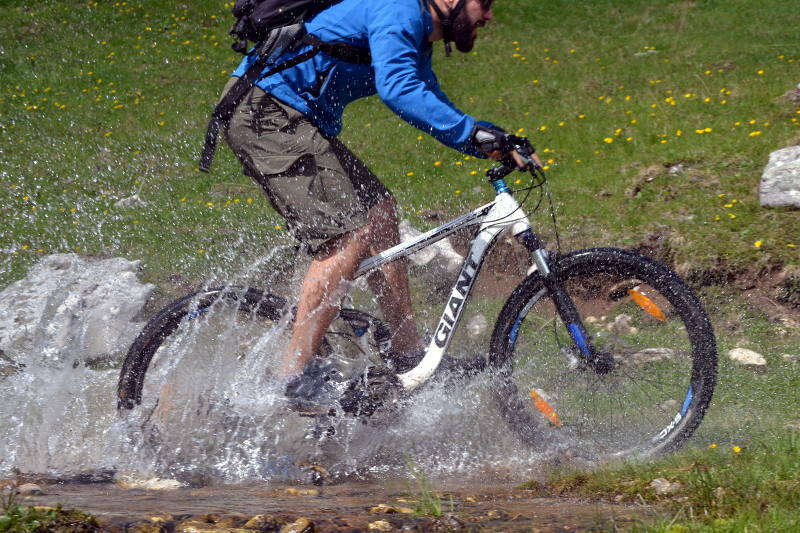 Bojan with Montenegro+ took an extra turn to bike through the water. Wild flowers on a green field surrounded by a massif of rock, the bikes at times were just incidental to the nature around us. This is #crazygoodtravel meets #crazygoodskiing. Bay of Kotor beauty meets 300 years of tradition at The Old Mill on Lustica.